Our speaker for the April dinner meeting was Doug Ellis. Mr. Ellis is a volunteer pilot with Angel Flight Soars. Angel Flight provides free air transportation for medical patients in the southeast, covering the six states of Georgia, North Carolina, South Carolina, Tennessee, Alabama, and Mississippi. Patients are typically receiving lifesaving treatment, such as for cancer or severe burns. They might not be able to handle long automobile trips. If they have compromised immune systems, they might not be able to use commercial air travel because they need to avoid crowds. Oftentimes patients live in rural areas. Whatever the reason, Angel Flight exists to be sure the cost or complexity of travel does not prevent people from receiving medical treatment. 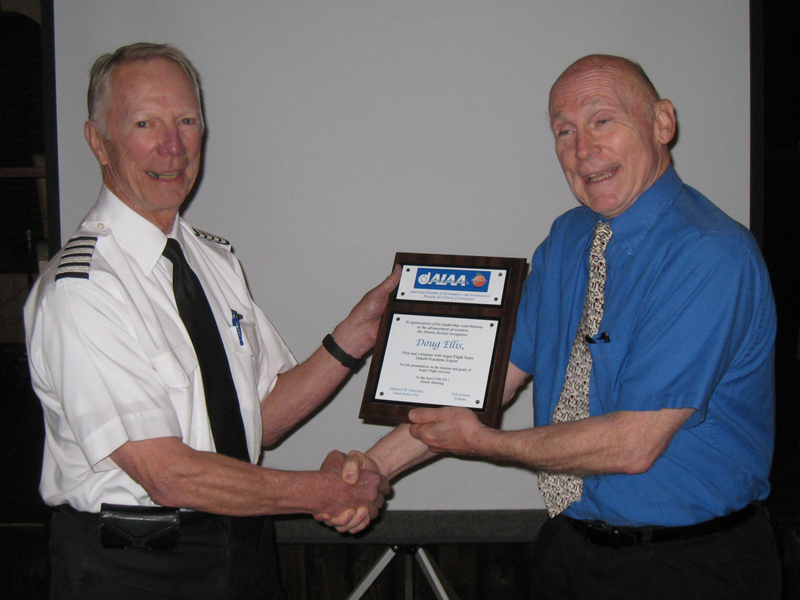 Doug Ellis receives a thank-you plaque from Bob Greene. Mr. Ellis asked us to pass along two pieces of information. First, please be sure your doctor knows that Angel Flight is available. Secondly, Angel Flight needs experienced pilots. The organization is a 501(c)(3), meaning your gift is tax-deductible.